The Republic of Haiti has a Presidential run-off election on Sunday, 20 March 2011, between Mirlande Manigat and Michel Martelly. Much is at stake for the country. Although the next President cannot single-handedly bring about the systemic change and long term efforts needed for the country to rise from the devastation that the January 2010 earthquake added to the fragile country, the next President will play an indispensable role in the country's successes or setbacks. I write to solicit your prayers for important and innovative work that we are doing for Haiti. Your generosity during the last year has enabled us to respond effectively after the January 2010 earthquake centered at Leogane, the city of one of the churches we support. We supported first responders and rescuers. We connected medical personnel to volunteer opportunities. We gave cash grants and food grants to families. We provided food for hospital patients by purchasing crops from farmers, paying caterers to cook, and delivering fresh and nutritious meals to the St. Your generosity during the last year has enabled us to respond effectively after the January 2010 earthquake centered at Leogane, the city of one of the churches we support. We supported first responders and rescuers. We connected medical personnel to volunteer opportunities. We gave cash grants and food grants to families. We provided food for hospital patients by purchasing crops from farmers, paying caterers to cook, and delivering fresh and nutritious meals to the St. Nicholas Hospital in St. Marc. We have provided pastoral care support for pastors and their families. 12 January 2011 is the one year anniversary of the devastating earthquake in Haiti. We recognize this occasion with grief and with hope. 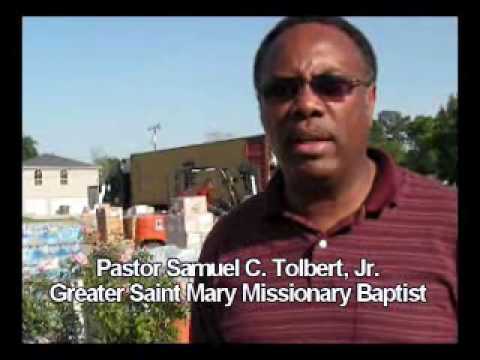 On 30 December 2010, the African American Baptist Mission Collaboration transferred five hundred thousand dollars ($500,000) to Habitat for Humanity International to provide permanent housing solutions in Leogane, Haiti in the aftermath of the January 2010 earthquake. The Collaboration is a partnership between Lott Carey; National Baptist Convention, USA, Inc; National Baptist Convention of America; National Missionary Baptist Convention of America; and Progressive National Baptist Convention. Lott Carey Executive Secretary-Treasurer, Rev. David Emmanuel Goatley, Ph. D., authored the following article for the September 2010 edition of the Habitat World magazine. See the magazine at Habitat World Magazine. Today, we loaded the last of more than 50 tons (100,000+) of supplies left our warehouses in Lake Charles, LA to be loaded on a ship and sent to Haiti. This shipment is in addition to several tons of supplies we sent in partnership with Friendships Unlimited that sailed several weeks ago. See a video report here. See additional video updates on Lott Carey TV on YouTube. We rejoice in this partnership between National Baptist Convention of America and Lott Carey that is showing that "Faith Works"! On Wednesday, 31 March 2010, international leaders are meeting at the United Nations headquarters in New York for and International Donors’ Conference for Haiti. Some estimates hold that Haiti will need $4 billion in investments during the next 18 months to rebuild hospitals, schools, roads and ports, as well as to rebuild and re-design Haiti in a way enables growth and strength. Afterward, additional funds will be needed to support reconstruction and renewal agenda. We pray for grace and guidance for those who will engage in this important work for our sisters and brothers in Haiti. A small Lott Carey team spent last week in Haiti. The purpose of our visit was to listen and learn, to offer a ministry of encouragement, to review our first phase of response, and to plan our next 90 days strategy. God blessed our four person team with safe and productive work. We are calling you to action to bring the attention to two troubling developments in Haiti to your United States Congressperson and your two Senators. Read more about A Call to Action!